Reliance Jio Infocomm Ltd (“RJIL”) announces that it has successfully acquired the right to use 269.2 MHz (UL+DL) spectrum across all 22 Service Areas in India in the recently concluded spectrum auction conducted by DOT, Government of India. 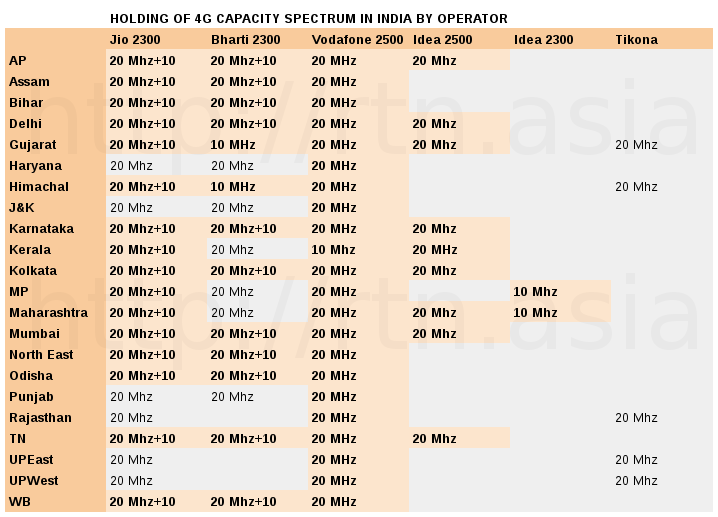 Service Area wise details of spectrum acquired are as per below. RJIL has renewed its expiring spectrum in 800 MHz band in Gujarat circle and purchased additional spectrum in the 800 MHz, 1800 MHz and 2300 MHz bands at 6.5% premium to reserve price. The purchases are below expectations set by its huge earnest money deposit. However, given the company’s already strong spectrum footprint, experts anticipated something like this. Like Airtel, Jio has gone for topping up its 2.3 GHz holding by adding another 10 MHz to it. It’s other expenditures were intended to plug the gap in its 1.8 GHz holding and 800 MHz assets. This leaves Vodafone as the likely big spender at the 2016 auction. Though the company has not revealed the numbers yet, it looks likely that it spend between Rs 20,000 and Rs 22,000 on purchasing new spectrum in this round. “Through this acquisition, RJIL’s total spectrum footprint has increased to 1,108 MHz (UL+DL) with an average life of over 16 years, further strengthening its leadership position in liberalized spectrum holdings. RJIL’s spectrum footprint ensures availability of spectrum in all the three bands across the country and enhances its network capacity at negligible incremental capital and operating expenditure,” Jio said. All figures as of after 2016 auctions. Bold indicates new purchase.